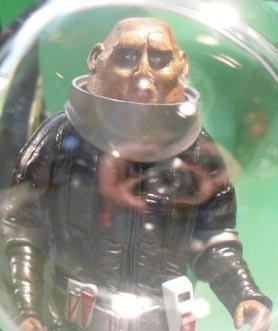 Several figures make their AFT debut in this story including the two Sontarans, Leela, Morbius and of course Omega. 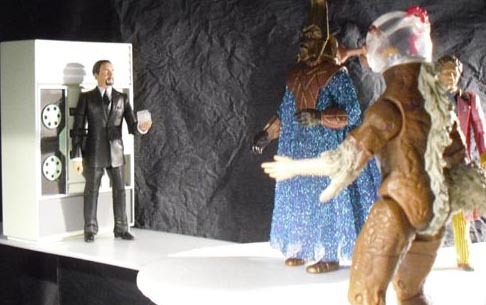 There are three Time Lord figures, one has been given a beard and another has had his skin painted brown. Hedrix is a 'Narrator' figure with the head of Nick Cutter from Primeval. Cardinal Vistan is a Severus Snape figure wearing a Time Lord cowl painted black. 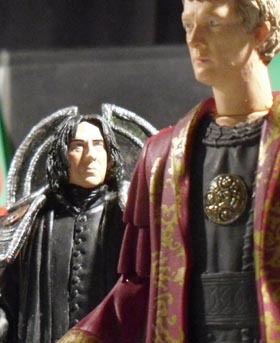 This figure had been on the cards since the Snape figure in this scale was released but the character wasn't devised until relatively recently. He was called Viston in the original script. Inspiration was totally the Omega figure. The release of this figure harks back to when I first saw The Three Doctors as part of The Five Faces of Doctor Who season back in 1981 and loved this all powerful Time Lord. The story was rushed into production when I realised it could be the perfect precursor to a mammoth upcoming arc. This is not normally the kind of story I like to do. I find bringing together several monsters an overly fannish thing to do and something to be saved for special occasions and anniversaries. This isn't me trying to contrive a way to bring as many people together as possible, but more like being able to tell a story within the Whoniverse because we have so many classic figures available now. By the way, the idea of Omega shooting laser beams from his fingers comes from the cover of the target novelisation of The Three Doctors. The script was completed on 2 Jan 2012 with some rewrites to part three, specifically giving Morbius and the Master something more to do to justify their inclusion in the story. Originally, the Doctor's plan to thwart Omega would have been successful and there is an element of it that we still may return to. The planetoid does is still there after all, frozen in time. 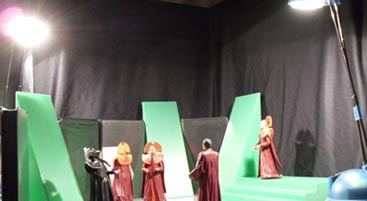 Filming began on 15th January with the sets for Gallifrey- a basic black box set with three green plastic pillars and a set of steps. This was moved about and redressed for the various Gallifrey locations between 15th and 17th January. I'm particularly pleased with the map room where the Time Lords monitor the time vortex on seemingly ancient paper maps. On 19th January the set was switched to Omega's planetoid which is made of white plastic walls and black video boxes. Normally, these make very sturdy flats to hold up paper scenery, but for this set they are bare. Also shot on the 19th was the TARDIS interior scene for part one. The spare TARDIS scene (called the Black TARDIS in the script) was filmed on 22 January and uses the Hartnell console with the regular TARDIS walls in a different configuration with the main doors at the back of the set. 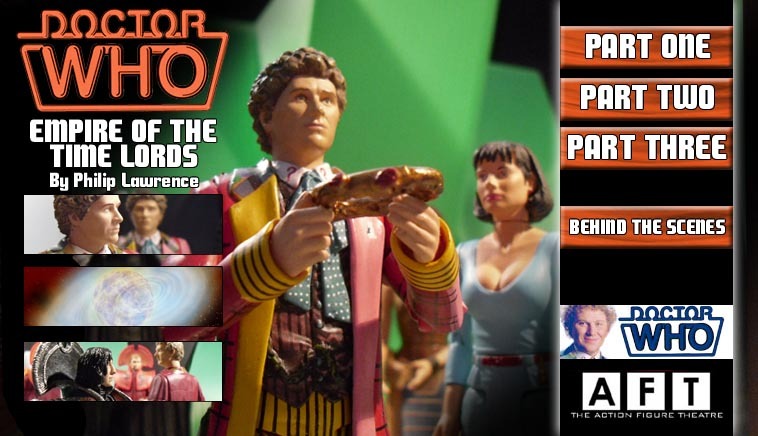 Filming was then conducted as required- pick up shots for part two were done on 21 Feb and included minor set pieces such as Leela and K-9's jaunt through time and space and the Doctor's visit to young Peri. Final shots for part three were done on 3 March- a single shot of Sturg in his ship and the 'tranquil planet' where the Doctor and Leela part company. This forest also doubled up for a short scene in this month's episode of The Planet At The End of the Universe. Episodes one and two were edited in January ahead of their respective postings apart from a few scenes for page two of part two. Editing for part three took a little longer with the images set by 10 March but lettering completed on the 20th. Part one was posted 23 January 2012 with part two following on 23 February and part three on 23 March. The first part was posted with an alternate cover so as not to spoil the return of Omega in the final frame. What's that? Not everything's been explained in the story? No, this is just the beginning of a much larger tale but answers are coming. So what are the questions you should be asking? 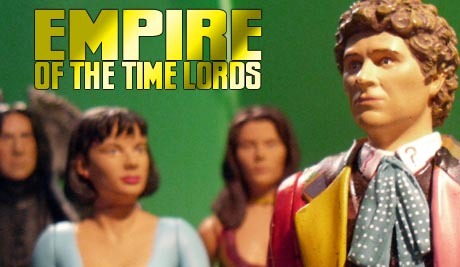 What is Vistan's secret project that is taking so much of the Time Lord's power? And why were there gaps in the Time Lords vortex maps? There is so much continuity involved here, both from the TV series and the AFT. If you're struggling to remember it all here it is. 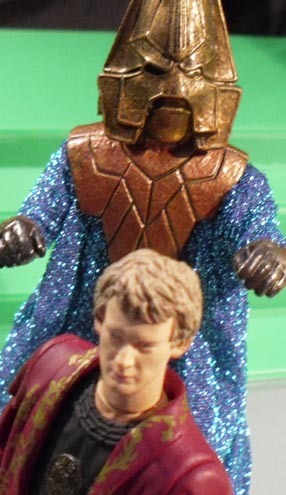 Omega was the stellar engineer who alongside the fabled Rassilon created the Time Lords' time travel ability. We first meet Omega in The Three Doctors where we learn that by exploding the black hole necessary to create Gallifrey's time travel power source, Omega was trapped in the universe of anti matter, alone and going slowly nuts. His plan then is to escape the antimatter universe leaving the Doctor behind in his place but the three Doctors thwart him. He returns in Arc of Infinity, this time with a plan to replicate the Doctor's body. Again this fails and it is left unclear whether he dies or returns to his antimatter prison. Morbius was an old renegade Time Lord that was tried and supposedly executed on the planet Karn but his brain was saved by one of his acolytes. We meet him in The Brain of Morbius where the acolyte Solon makes a body for Morbius from a mish mash of alien parts. The patchwork monster is cornered on a mountain by fire wielding Sisterhood of Karn and sent plummeting to his supposed death where we pick up the story in part two of Empire of the Time Lords. Leela, former companion of the fourth Doctor remained on Gallifrey with K9 mark 1 at the end of The Invasion of Time to marry the Chancellory Guard Andred. In terms of the Time Lords' timeline, we're between The Five Doctors and The Trial of a Time Lord. The Doctor was made Lord President at the end of The Five Doctors. In terms of the AFT chronology, the last time we saw the Time Lords was in their previous encounter with the sixth Doctor in 2011's Time Locked. Chronologically their next AFT story is the 7th Doctor adventure, The Doctor's Dilemma ahead next month's episode.